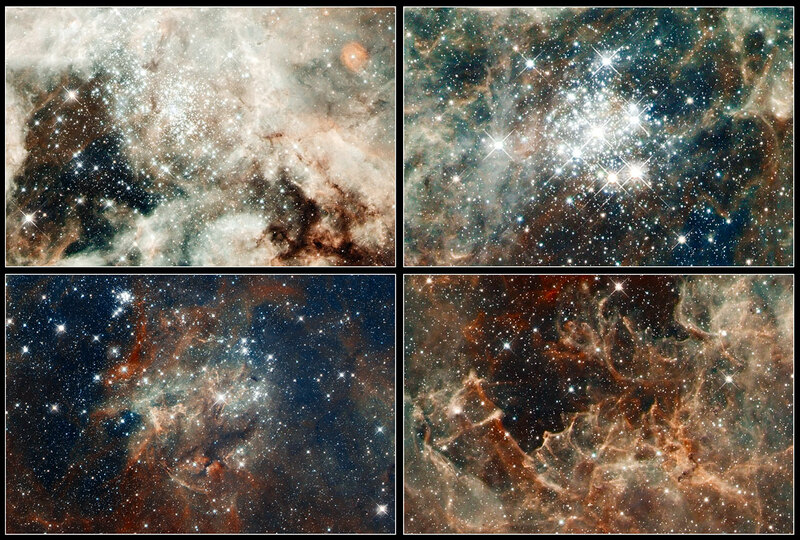 view of the Tarantula nebula, revealing its bright heart of massive stars. The photo is actually a colossal mosaic, one of the largest ever built from Hubble Space Telescope images, and shows an intense star-forming hotspot called 30 Doradus. Hubble’s science team unveiled this new image on April 17. Hubble’s new view of the region inside the Tarantula nebula shows massive stars‘ winds carving cavities into gas clouds, creating a fantasy landscape of pillars, ridges and valleys. The spectacular colors are created by glowing hot gas. Hydrogen appears as red while oxygen shows up in blue. The image covers an area about 650 light-years across. The Tarantula nebula is located 170,000 light-years from Earth in the Large Magellanic Cloud, one of the smaller satellite galaxies that hover around our own Milky Way. Inside the nebula is 30 Doradus, which, because of its local proximity to our galaxy, has long been a cosmic laboratory of sorts for astronomers studying how stars are born and evolve. The most massive runaway star ever seen and one of the fastest rotating stars are just two of the region’s tenants, Hubble researchers said. Star clusters from 2 million to 25 million years old can also be found. The furious pace of star birth inside 30 Doradus is partly fueled by the Large Magellanic Cloud’s neighbor, the Small Magellanic Cloud. In the Hubble Space Telescope view, various stages of the star life cycle are evident, ranging from embryonic stars a few thousand years old to stellar giants that live fast and die young in supernova explosions.